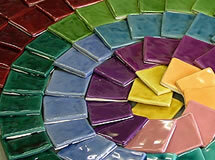 We offer a wide range of bespoke and standard tiles and clay products. Please contact us if you would like to discuss your requirements. We offer a wide spectrum of designs, each tile is cut, trimmed and glazed by hand and bears the handprint of the tile maker. Decorative tiles are handpainted in enamels or tubelined and glazed with traditional techniques. Our ranges are available through a small number of retailers throughout the UK. 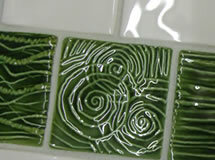 At Tile Productions we love to produce something special and original to our customers requirements. We work together with our clients to produce something unique. After 10 years of manufacturing we had a problem of what to do with our left over clay. 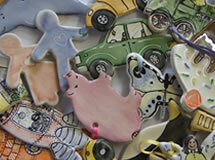 We started producing Tag Tiles, the range of tags/Christmas decorations has grown and grown, they are proving quite popular. Bespoke orders are often made from wedding favours to christening gifts. Tile productions are now happy to be working alongside a few local charities which order special designs to raise money. We are always thinking of new designs and products. 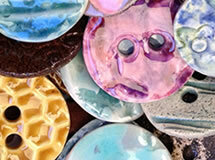 Our most recent new product that has been requested by a local artist are handmade buttons. At the moment we are working on some new tile designs and incorperating other artists work to complement our tiles for something different and exciting.